This cherry crumble is like a cherry pie without the fuss. EASY. 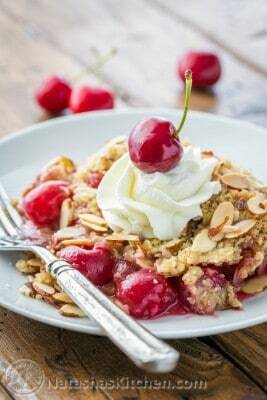 The crumbly crisp almond topping is a perfect match to those juicy plump cherries. Prep: Preheat oven to 350˚F. Pit Cherries. In a small bowl, stir together 1/4 cup flour and 1/4 cup sugar. In a medium bowl, toss cherries with 2 Tbsp lemon juice and 1/2 tsp vanilla. Sprinkle the top with your flour/sugar mixture and stir to evenly coat cherries. Transfer cherries to a 9x13 or 9x12 baking dish. In the bowl of a food processor fitted with a steel blade, combine: 1 cup flour, 1/4 cup granulated sugar, 1/3 cup brown sugar, and 1/8 tsp salt. Pulse to combine. Add 1 stick diced cold butter and pulse until butter is pea-sized. Transfer mixture to a medium bowl, add 1/2 cup oats and use your hands to make large crumbs, rubbing the mixture between your fingers. Add 1/2 cup shaved almonds and toss to combine. Spread the crumble topping evenly over the cherries and sprinkle on the second 1/2 cup sliced almonds. Bake uncovered at 350˚F for 45 minutes, or until almonds are golden brown and cherry juices are bubbling at the edges. Let crumble cool at least 15 minutes before serving; cherry juices will thicken as it cools. If you are making it with frozen cherries, make sure to defrost them completely or crumble will need to bake a little longer.